Aventus Aretino is a Nord child located in the Aretino Residence in Windhelm. He escaped from Honorhall Orphanage in Riften, where he ended up after his mother, Naalia Aretino, died from sickness during the winter, and he now seeks revenge on the owner of the orphanage, Grelod the Kind, for mistreatment of orphans. Aventus wears red colored child's clothes and a pair of shoes, and is equipped with a simple iron dagger. He carries a key to his house, a selection of food and toys, and a small amount of gold. Rumor has it that he is attempting to contact the Dark Brotherhood. If you track him down, you will find him chanting the Black Sacrament and he will assume that you are a member of the Dark Brotherhood. Speaking to him gives the quest Innocence Lost, which leads to your entrance into the Dark Brotherhood. 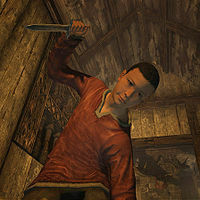 He can be found in the Aretino Residence constantly trying to call the Dark Brotherhood. While his actions remain the same, his dialogue rotates between several lines until you reveal yourself: "Sweet Mother, sweet Mother, send your child unto me, for the sins of the unworthy must be baptized in blood and fear. ", "Please... How long must I do this? I keep praying, Night Mother. Why won't you answer me? ", "Die, Grelod! Die! ", "So... very tired...", and "Grelod, you old crone. You'll get what you deserve. The Dark Brotherhood will see to that..."
"I'm sorry, boy, but I'm not who you think I am." "Of course you are! I prayed, and you came, and now you'll accept my contract." "Yes, of course... The Black Sacrament..."
"It took so long. So very long. But now that you're here, you can accept my contract." "You don't have to say anything. There's no need. You're here, so I know you'll accept my contract." Each path leads to asking about the contract, to which Aventus will reply, "My mother, she... she died. I... I'm all alone now. So they sent me to that terrible orphanage in Riften. Honorhall. The headmistress is an evil, cruel woman. They call her Grelod the Kind. But she's not kind. She's terrible. To all of us. So I ran away, and came home. And performed the Black Sacrament. Now you're here! And you can kill Grelod the Kind!" Before you leave, you can talk to Aventus for more information, such as the reward and a bit of his back story. Telling him that assassinations don't come cheap will result in the reply, "I have a family heirloom you can have. Supposed to be sort of valuable. I hope that's all right." If you ask him what happened to his mother, he will explain, "She got sick, last winter, when the snows came. And she just... she never got better. Not all year. One night she fell asleep and... never woke up. So now I'm all alone. And the Jarl said I had to go to Honorhall Orphanage. It's not fair!" Questioning him about how sure he is about murdering Grelod will have him answer, "I've never been more sure about anything in my entire life. Someone like Grelod doesn't deserve to live one more day. She's a monster." If you have already killed the target, he will be amazed and remark, "I mean, I knew the Dark Brotherhood was good... just not that good! You killed the old hag before I even asked!" After completing his quest, he claims that he's going to be an assassin himself when he grows up: "When I grow up, I'm going to be an assassin. That way I can help lots of children, just like you." However, in the short term, he decides that he will return to the orphanage: "I'll go back to the Orphanage in a while. I'll give them time to, you know... clean up the mess." (though he never does - see below). Aventus cannot be adopted, even when the Hearthfire add-on is installed. Aventus is sometimes referred to as an Imperial in dialogue from other NPCs. If you attack him, Aventus will say, "Wait! That's not how this is supposed to work!" if he is in the Aretino Residence, and "What are you doing? I thought we were friends!" if not. Aventus doesn't travel to the orphanage after the completion of Innocence Lost, as he should. Mod Notes: The conditions on the AventusAretinoHonorhallSandbox package require that Aventus already be in Honorhall Orphanage in order for it to activate, so it never kicks in. This page was last modified on 27 August 2015, at 17:24.